The exclusive Infinity heat pump with Greenspeed intelligence is the first of its kind and delivers superior performance, unprecedented heating efficiency, and the ability to make your home quietly more comfortable whilst offering huge energy savings. The Carrier Infinity Series with Greenspeed Intelligence Heat Pump offers up to 20 SEER and unprecedented heating efficiency of up to 13 HSPF thanks to the innovative energy-saving inverter-driven variable-speed operation that matches your comfort needs with heat pump performance. Greenspeed intelligence delivers superior humidity and temperature control as it monitors various critical system functions and adjusts operations to offer the best in performance and system reliability. You are afforded peace of mind due to the enhanced diagnostics offered by the intuitive Infinity Control which puts control firmly in your hands. You are able to control the heating, cooling, comfort schedules, humidification and dehumidification, fan speeds and much more from an easy-to-use wall-mounted control – remote control can be added as an accessory. 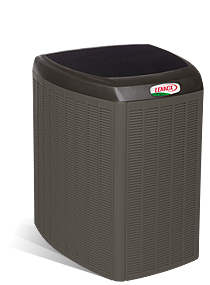 This Infinity heat pump with variable-speed scroll compressor closely matches heating and cooling requirements in order to maintain consistent comfort in your home. The Infinity 20 heat pump with Greenspeed intelligence matches both indoor and outdoor conditions to provide the most comfort for the lowest cost. The Carrier Silencer System II ensures that the operating noise remains as low as 58 dB, which exceeds the local and industry sound standards. This is achieved with a compressor sound blanket, a laminated sound elimination compressor mounting plate, quiet motor mounts, forward swept fan blades, and a unique top with integrated silencer airflow baffle. The WeatherArmor System is a Carrier innovation that offers ultimate protection for your unit against bad weather and increases durability. It shields the unit from lawn equipment, errant soccer balls, hail and various other hazards that could damage it. 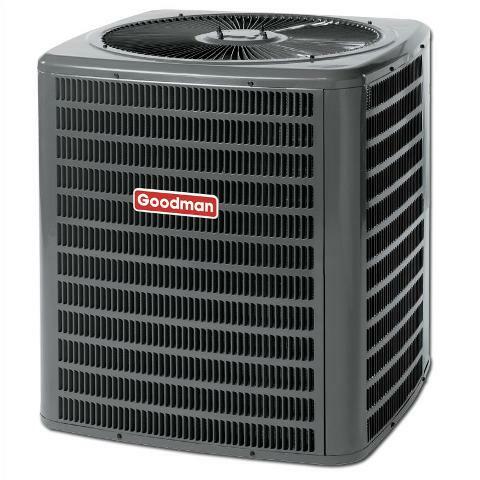 The combination louvered coil guard, galvanized steel cabinet and baked-on powder paint keeps your Carrier Infinity Series with Greenspeed Intelligence Heat Pump looking good for many years and offers superior rust protection. The Environmentally-sound Puron refrigerant is non-ozone depleting and designed not to harm the earth’s ozone layer. 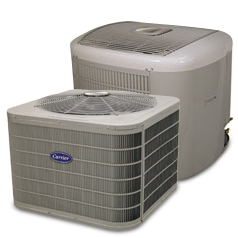 It is approved by the US Environmental Protection Agency as a replacement from Freon 22. The Carrier Infinity Series with Greenspeed Intelligence Heat Pump comes with a 10-year parts limited warranty, to the original owner, when properly registered. 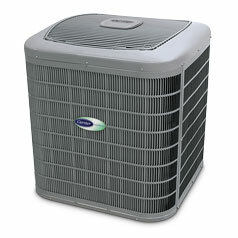 This heat pump meets the ENERGY STAR guidelines for efficiency. This unit also features enhanced diagnostic intelligence. Environmentally sound Puron refrigerant is designed not to harm the earth’s ozone layer, in accordance with Federal law requirements to phase out ozone depleting refrigerants. The variable-speed scroll compressor works in a circular motion as opposed to the usual up and down piston action for better efficiency. 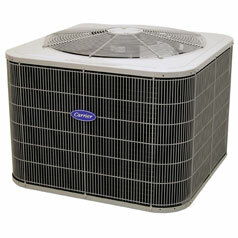 This unit has a cooling capacity of 2 – 5 tons, and a heating capacity of 22,600 – 60,000 Btuh. 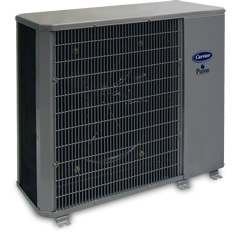 Carrier Infinity Series with Greenspeed Intelligence Heat Pump sports the Carrier HYBRID HEAT dual fuel system, which pairs an electric heat pump with a gas furnace and compatible thermostat to provide economy, comfort, and flexibility. The HYBRID HEAT dual fuel system automatically switches between gas and electric heating s required in order to maintain the ultimate in home comfort, whilst optimizing each fuel source’s efficiencies to save you on utility costs. This unit is constructed out of heavy-gauge galvanized steel for great strength and durability. The unit is painted in baked-on powder coat paint for added protection. It has WeatherArmor to protect your outdoor unit from radical weather conditions. The coil-guars is a steel, louver coil guard. 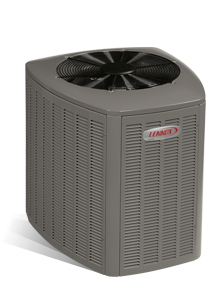 The Carrier Infinity heat pump is covered by a 10-year parts limited warranty upon timely registration, to the original owner. The limited warranty period is 5 years if not registered within 90 days of installation. 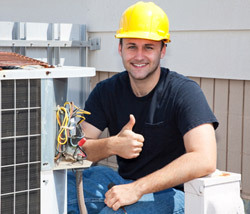 Be sure to ask your Carrier dealer about further optional labor warranties. In jurisdictions where warranty benefits cannot be conditioned on registration the registered 10-year parts limited warranty period will come into effect. The warranty certificate on carrier.com can be viewed for further details and restrictions.